If you still can't find the answer you're looking for then please feel free to contact us and we will be happy to try and help. Any x-ray involves radiation but mammograms only require a very low dose. It is about the same as the dose a person receives by flying from London to Australia and back. The risk that such a low dose could cause a cancer is far outweighed by the benefits of early detection of breast cancer. A specialist nurse who is available for information, advice and support for all women. If you would like to speak to a breast care nurse please contact us on 020 3758 2024 . Yes, we have a number of screening sites in your local area. (View alternative locations for your screening appointment). Please use the change appointment form. If none of these sites are convenient for your place of work, please contact us by telephone on 020 3758 2024. Yes. Please be aware that there is limited space at some of our screening sites particularly the mobile screening vans and for privacy reasons men are not allowed on mobile vans. Yes, please complete the online change appointment form to alter the date, time or location of your screening appointment. An expert who specialises in imaging (x-rays and ultrasound). 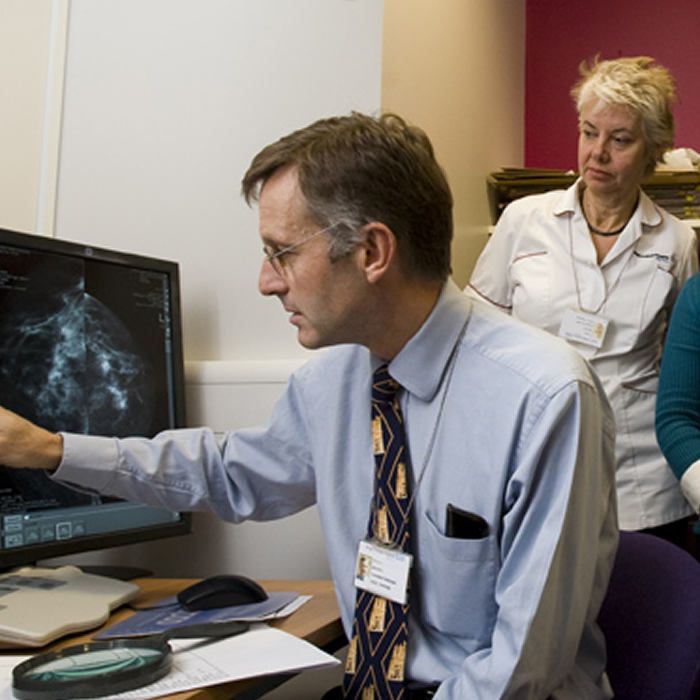 Consultant Radiologists in breast screening read your mammograms (x-rays) to give a result. They also perform ultrasound scans and biopsies if further tests are needed. Some women find mammography uncomfortable and some find it painful, as the breasts have to be held firmly in position and pressed to take a good x-ray. If you do experience pain it usually only lasts as long as the mammogram, although it may continue for some time in a small number of women. No. Breast screening aims to find breast cancer at an early stage when it may be too small to feel. Finding breast cancer early greatly increases your chances of successful treatment. A mammogram takes a few minutes, however your whole visit to the screening unit will take about half an hour depending upon how busy it is. Yes. The risk of getting breast cancer increases as women get older and we encourage women over 70 to continue with three yearly screening. All women over the age of 70, who are not included in the age extension pilot,will need to phone the office on 020 3758 2024 to arrange their appointment. Currently the breast screening programme does not routinely screen all women under the age of 50. This is because 80% of all breast cancers occur in women over the age of 50. We have, from June 2011, extended the breast screening programme to include some women between 47 and 49 years, and some women between 71 and 73 years, as part of the age extension pilot. Routine screening in women below the age of 50 has not yet shown to be of benefit. If you do not receive an appointment and you are below 50 years of age, then you have not been included in this pilot. All women should continue to be breast aware. If you have a family history of breast cancer please see your GP who may refer you to a family history clinic at your local hospital. The family history clinic will assess your need for extra mammographic screening. We respect your decision not to be screened, although we would encourage all women to attend for breast screening when invited. However if you choose not to take up your invitation please contact the screening office so your appointment is not wasted. You can contact the screening office on 020 3758 2024. If you have a breast lump or any other breast symptom you should see your GP, who may organise a referral to the breast service at your local hospital. Please contact the office on 020 3758 2024 to discuss your appointment, as we may need to allocate more time for your screening. Your appointment may be made at a local screening unit, where we have better disabled access. If you fear you are more at risk of breast cancer because of your family history you should discuss this with your GP. Your GP can advise you further and may refer you to a Family History clinic at your local hospital. They will assess your risk and arrange extra screening if needed. Your pacemaker may hide the small area of breast tissue behind the pacemaker, preventing it from being seen on the x-ray. The film readers will only be able to report on the breast tissue that they can see on your mammogram. Please contact the screening office on 020 3758 2024. Please contact the screening office on 020 3758 2024 for advice on whether you should attend for this screening appointment. Yes because you still have breast tissue, which should be screened. There is no evidence to suggest breast implants are damaged by mammograms. If you have implants and have been made an appointment, please contact the office on 020 3758 2024 to discuss your screening appointment, as we would like to allocate more time for your appointment. Breast implants appear as a solid white area on a mammogram. This may hide some of the breast tissue preventing it from being seen on the x-ray. The film readers will only be able to report on the breast tissue that they can see on your mammogram. If you have implants and you already have an appointment, please contact the office on 020 3758 2024 to discuss your screening appointment, as we would like to allocate more time for your appointment. We are happy to screen women who have had breast cancer. If you have recently had a mammogram please contact the office on 020 3758 2024 for advice. If you have notified your practice of your new address you will be invited for screening at the normal time. If you have moved house and fear you may have missed a screening appointment please contact the screening office on 020 3758 2024. Please contact the screening office to change your appointment and we will arrange a new appointment for you. If you prefer you can telephone the office on 020 3758 2024, and we will be happy to make you another appointment. A doctor who specialises in the diagnosis of disease and conditions by examining cells and tissue under the microscope. Takes the mammogram (x-ray). All radiographers working in the NHS Breast Screening Programme have undertaken specialist training in mammography. If further treatment is needed, women will be referred to a specialist breast surgeon at their local hospital or at a hospital of their choice. This is when a tissue sample is taken from the breast using a special sampling needle. Local anaesthetic is used for the procedure. A mammogram is an x-ray examination of the breasts and is a method of finding breast cancer at a very early stage. A female mammographer will compress your breasts, one at a time between two special x-ray plates and take the x-rays. The compression only lasts a few seconds and does not cause any harm to the breasts. Compression is needed to keep the breast still and to get the clearest picture with the lowest amount of radiation possible. An utltrasound is a scan which shows a picture of the tissues within the breast. It uses sound waves to create an image of the breast tissue. Cytology – where a few cells may be removed from your breast with a very fine needle and examined under a microscope. This test is similar to having blood taken. The examination of tissues under the microscope to assist diagnosis. You will be asked to undress completely down to your waist so it is a good idea to wear separates instead of a dress. See your GP without delay even if you have had a recent mammogram. Breast changes can occur at anytime and should be investigated promptly. Your results will be sent to your home address and this should be within 2 weeks. You will be advised of any expected delays at the time of your screening. Your mammogram will be performed either at a mobile screening van or static screening unit within a building, at one of our local screening sites. A female mammographer will always perform the x-ray. From time to time screening locations can change due to availability. If the site you have been called to is not convenient you can request a change your appointment form. From time to time changes to the screening plan result in women receiving an appointment slightly earlier than the standard 3 years, but if you believe it's been more than 3 years since your last screening mammogram please phone the screening office on 020 3758 2024. Latest news including information for women who are worried that they may have missed an invitation for screening. If you already have an appointment, but would like to change it, we will be very happy to arrange this for you.